X A strange seed was planted on its back at birth. The plant sprouts and grows with this Pokémon. X Una rara semilla le fue plantada en el lomo al nacer. La planta brota y crece con este Pokémon. X Alla nascita gli è stato piantato sulla schiena un seme raro. La pianta sboccia e cresce con lui. X 태어났을 때부터 등에 이상한 씨앗이 심어져 있으며 몸과 함께 자란다고 한다. Y For some time after its birth, it grows by gaining nourishment from the seed on its back. Y Después de nacer, crece alimentándose de las semillas de su lomo. Y Dopo la nascita, cresce traendo nutrimento dal seme piantato sul suo dorso. Y 태어나서부터 얼마 동안은 등의 씨앗으로부터 영양을 공급받아 크게 성장한다. Omega Ruby Bulbasaur can be seen napping in bright sunlight. There is a seed on its back. By soaking up the sun’s rays, the seed grows progressively larger. Omega Ruby Bisasam macht gern einmal ein Nickerchen im Sonnenschein. Auf seinem Rücken trägt es einen Samen. Indem es Sonnenstrahlen aufsaugt, wird er zunehmend größer. Omega Ruby Bulbizarre passe son temps à faire la sieste sous le soleil. Il y a une graine sur son dos. Il absorbe les rayons du soleil pour faire doucement pousser la graine. Omega Ruby A Bulbasaur es fácil verle echándose una siesta al sol. La semilla que tiene en el lomo va creciendo cada vez más a medida que absorbe los rayos del sol. 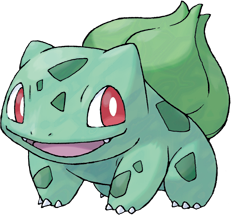 Omega Ruby È possibile vedere Bulbasaur mentre schiaccia un pisolino sotto il sole. Ha un seme piantato sulla schiena. Grazie ai raggi solari il seme cresce ingrandendosi progressivamente. Omega Ruby 양지에서 낮잠 자는 모습을 볼 수 있다. 태양의 빛을 많이 받으면 등의 씨앗이 크게 자란다. Alpha Sapphire Bulbasaur can be seen napping in bright sunlight. There is a seed on its back. By soaking up the sun’s rays, the seed grows progressively larger. Alpha Sapphire Bisasam macht gern einmal ein Nickerchen im Sonnenschein. Auf seinem Rücken trägt es einen Samen. Indem es Sonnenstrahlen aufsaugt, wird der Samen zunehmend größer. Alpha Sapphire Bulbizarre passe son temps à faire la sieste sous le soleil. Il y a une graine sur son dos. Il absorbe les rayons du soleil pour faire doucement pousser la graine. Alpha Sapphire A Bulbasaur es fácil verle echándose una siesta al sol. La semilla que tiene en el lomo va creciendo cada vez más a medida que absorbe los rayos del sol. 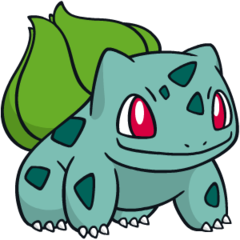 Alpha Sapphire È possibile vedere Bulbasaur mentre schiaccia un pisolino sotto il sole. Ha un seme piantato sulla schiena. Grazie ai raggi solari il seme cresce ingrandendosi progressivamente. Alpha Sapphire 양지에서 낮잠 자는 모습을 볼 수 있다. 태양의 빛을 많이 받으면 등의 씨앗이 크게 자란다. Red A strange seed was planted on its back at birth. The plant sprouts and grows with this Pokemon. Yellow It can go for days without eating a single morsel. In the bulb on its back, it stores energy. Stadium The bulb-like pouch on its back grows larger as it ages. The pouch is filled with numerous seeds. Gold The seed on its back is filled with nutrients. The seed grows steadily larger as its body grows. Silver It carries a seed on its back right from birth. As it grows older, the seed also grows larger. Crystal While it is young, it uses the nutrients that are stored in the seeds on its back in order to grow. Stadium2 The seed on its back is filled with nutrients. The seed grows steadily larger as its body grows. Ruby Bulbasaur can be seen napping in bright sunlight. There is a seed on its back. By soaking up the sun's rays, the seed grows professively larger. Sapphire BULBASAUR can be seen napping in bright sunlight. There is a seed on its back. By soaking up the sun's rays, the seed grows progressively larger. Emerald BULBASAUR can be seen napping in bright sunlight. There is a seed on its back. By soaking up the sun's rays, the seed grows progressively larger. Pearl For some time after its birth, it grows by gaining nourishment from the seed on its back. Platinum For some time after its birth, it grows by gaining nourishment from the seed on its back. Black For some time after its birth, it grows by gaining nourishment from the seed on its back. White For some time after its birth, it grows by gaining nourishment from the seed on its back. White 2 For some time after its birth, it grows by gaining nourishment from the seed on its back.